Why is Sonic Drive-In Called Sonic Drive-In? Whew. Pretty lofty goal right there. But with its fast service, fun menu, constant deals, kitschy drive-in concept, and lovably wacky commercials, Sonic Drive-In is doing what it can. SONIC-Drive In is an American drive-in fast-food restaurant chain based in Oklahoma. There are over 3,500 SONIC restaurants in 45 states. Its menu consists of standard American fare such as burgers, fries, onion rings, and hot dogs. Its drink selection is extensive, offering enough flavors to create over 1.3 million unique flavor combinations. Still, it’s got a way to go if it’s going to become America’s #1 most loved restaurant brand – in 2017, it was ranked 12th in QSR Magazine’s rankings of the top 50 quick-service and fast-casual restaurants in the nation. But it’s headed in the right direction, and it’s come a long way in over 50 years! 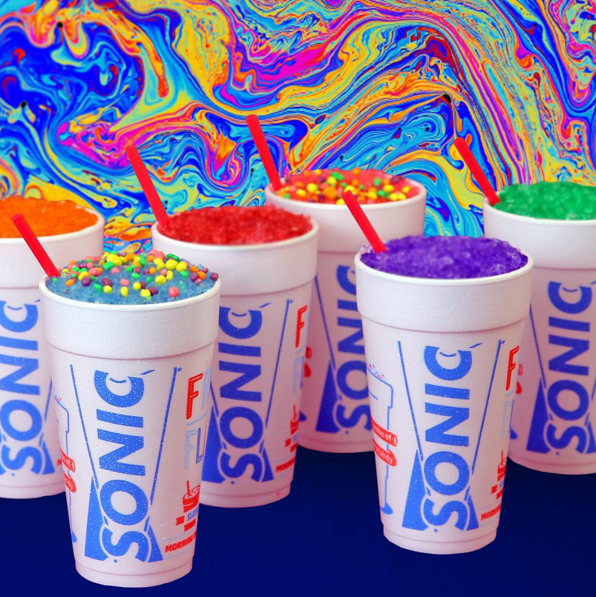 Just six of 1.5 million possible drink combinations at SONIC. Why is it called SONIC Drive-In? SONIC Drive-In started out as a little root beer stand called Top Hat in Shawnee, Oklahoma. SONIC founder Troy N. Smith Sr. bought a 5-acre lot of land that included the root beer stand and a log house. He converted the log house into a steak restaurant, but soon realized that simple root beer stand was making more money off the sales of just root beer, hamburgers and hot dogs alone. He bought out his business partner and focused on the more-profitable root beer stand. Top Hat customers would park anywhere in the gravel parking lot and walk up to the stand to place their orders. On a trip to Louisiana in 1953, SONIC founder Troy N. Smith Sr. saw a drive-in that used speakers for ordering. When he returned to Oklahoma, he had an intercom system wired into the lot, created set parking spots, had customers order from speakers in their cars, and used carhops to deliver the food straight to their cars. Sales immediately tripled. As SONIC started to expand and open new locations, Smith learned that the name Top Hat was already trademarked. In 1959, he and first franchise owner Charles Pappe decided to change the name to SONIC Drive-In, stylized with capital letters. The new name fit right in with the existing slogan: “Service at the Speed of Sound.” Both the slogan and the new name were inspired by SONIC’s newfangled intercom ordering system. Back in SONIC’s hay day, drive-in restaurants were very popular and common. Today, most of those restaurants have long since turned into drive-thrus. SONIC is unique precisely because it hasn’t changed much! It’s successful, it’s beloved, and it’s stayed true to its roots all these years – carhops, intercoms, roller skates, hot dogs and all. Do you think SONIC Drive-In will ever be America’s most beloved restaurant brand? What’s your favorite restaurant brand? Let us know in the comments!